Waiting around at fast food restaurants is about to be a thing of the past. 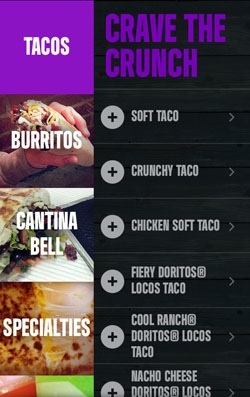 Mexican chain Taco Bell announced this its mobile ordering app is entering a beta test phase in California before rolling out to the rest of the country later this year, Nation's Restaurant News is reporting. The app offers other features as well, such as nutrition information. The app would make Taco Bell one of the first fast food restaurant chains to fully embrace ordering by smartphone. It’s far from the only company working on the tech. McDonalds is testing a pay-by-phone app at select Salt Lake City and Austin restaurants. Burger King has also been working on an app. Higher-end fast food chains have already embraced and found much success with mobile ordering. Chipotle has offered app-based ordering since 2009. And Pizza Hut has not only created its own phone app, but also an Xbox 360 app to order from, as well. Naturally, setting up a nationwide mobile ordering system for massive chain restaurants has a lot of logistical challenges. But for these restaurants, the effort is worth it. After all, according to these companies, mobile ordering is the next big thing. “Mobile is the biggest shift in (fast food) since the drive thru,” says Taco Bell Mobile Lead Jeff Jenkins.